Aatsinki's images are so careful and splendid that they encourage your reflection on what it means to tell and be told a story. "I used to know this reindeer. It ran away the autumn before last." Wrestling with his apparent acquaintance, Lasse Aatsinki smiles. It's a good joke: he and his brother Aarne run a herding collective in Finnish Lapland, and it's quite possible they know all the reindeer. 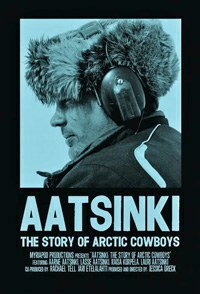 And that makes for a lot of knowing: throughout Aatsinki: The Story of Arctic Cowboys, you see hundreds of reindeer, gathering and grunting, striding and thronging. As the Aatsinkis move the herd, the work is physical in every sense, exhausting, never quite finished, and frequently undertaken in harsh conditions. Still, they look immersed in it, a notion the documentary makes beguilingly visible, in gorgeous images and also in its fundamental structure. Not only do you have the idea that the Aatsinkis are dedicated workers and family men, good at what they do, but also that they have something resembling relationships with their charges, whose ears they tag and whose movements they track. Shaping the mass as it trots along through snow and woods, the brothers find themselves in sync with their charges, sharing their daily rhythms as well as their surroundings, at once bleak and beautiful. Opened 24 January at IFC Center and screening at the Doc Yard on Monday, 27 January, where it will be followed by a Q&A with director Jessica Oreck, Aatsinki shows plenty of ruddy faces and wide snowy expanses, children dressed in bright green fleece or pink hats, and men in heavy boots, driving the deer from helicopters, piloting snowmobiles and ATVs, and sometimes or deer-drawn sleds. The camera pitches and ducks, it rides along behind or in front of the herders, it pauses, as if to rest, observing a long, long shot of deer walking across a horizon dotted by evergreen trees. Portraying the brothers' endeavors without explanations or interviews, Aatsinki invites you to ponder the complexities of these many interactions between some men and heir natural neighbors. (If you want more of this experience, you might check out the interactive Aatsinki Season.) Framed by what you may or may not know about reindeer herding, these interactions are alternately thrilling and troubling. For as it becomes clear the deer serve multiple purposes, from food and clothing to sled-hauler and tourist attraction, you see their status as resource, exploitable and not so plentiful as before, their environment changed by the herders' use of ATVs. This change affects the herders to a point: some activities remain much the same over decades. Preparing for long nights on the herding trail, the men whittle wood to make kindling for fires, boil water in pots they immerse in the flames, pulling them out charred and black, the steam mixing in air with the brothers' breath. They sit alongside red-hot campfires, make their way past and among trees turned into snow sculptures, huge round and wraithlike shapes, at once weightless and bent. When it comes time to kill a deer, the men proceed methodically, wielding knives as their coveralls are increasingly bloodied, their faces intent but revealing little. During one scene, a deer is disemboweled in close-up, the glossy gray and twisting bulbousness of the stomach strangely enthralling. This striking image of a suddenly loosed internal organ is but one instance of the film's attention to bodies as such, their corporeal pulsing and also how they become symbolic. This process has to do with context, here typically depicted in contrasts, between warm, fire-lit interiors and icy exteriors, men and deer, machines and humans. Noisy choppers rise over majestic forests, herders wrap themselves around reindeer whose ears they mean to tag, the animals' bodies so briefly thrashing, then quiet, eyes wide. But for all the discrete events portrayed in Aatsinki, the film is less concerned with these markers of a standard plot, with rising action or even individual subjects, than with daily routines and image patterns. In this it might seem not to tell a story so much as it records what happens. But the arrangements of these processes are so splendid, so careful, that they also compel your own process, encourage your reflection on what it means to tell a story and to read one, to make sense of images, ordering them into your own framework. In this, Aatsinki recalls recent films by Lucien Castaing-Taylor and Véréna Paravel, Sweetgrass and Leviathan, films finding poetry in thematic tensions and contradictions, in visual splendors and banalities. The precision and art of such storytelling can be breathtaking, in its seeming abstraction and unmistakable substance, in the bodies it renders, follows, and details. At the same time, such immersive experiences are also expanding ideas of what documentaries can show and frame. While it might seem a document, in the sense of offering objective-seeming representations of subjects and experiences, Aatinski draws attention to its own function as experience, its capacity to transport viewers.